Maybe he didn’t know their meaning, but he sensed the rhythm of every Our Father, Hail Mary and Glory Be. That was my first lived experience of the rosary’s power as a family prayer. In the mid-20th century, Father Peyton, who founded Holy Cross Family Ministries, also known as the “rosary priest,” became famous for the saying, “The family that prays together, stays together.” In his autobiography, he explained why praying to Jesus through Mary in the rosary was so fundamental to his childhood that it eventually became the core of his life. It would be a mistake, though, to mistake simplicity for insignificance, as there is much to be gained from praying the rosary frequently and with dedication. Archbishop Fulton J. Sheen, a great lover of the rosary, called the devotion “the place where the simple love grows in knowledge and where the knowing mind grows in love.” There is much depth to be found in the rosary’s simplicity. — The rosary is tactile. A rosary comes with an almost built-in “fidget spinner” for young ones. Holding a rosary in their hands, they can keep track of how much is completed and how much remains. The string of beads also serves as a physical manifestation of the relationship with Our Lady and her Son. Simply holding a rosary often gives comfort, especially to young ones — and even the very young can hold onto (or chew!) a baby-friendly version. As you touch the beads during prayer, you can hand over your worries, concerns, sufferings and pains to the Lord through his mother. — The rosary brings peace. 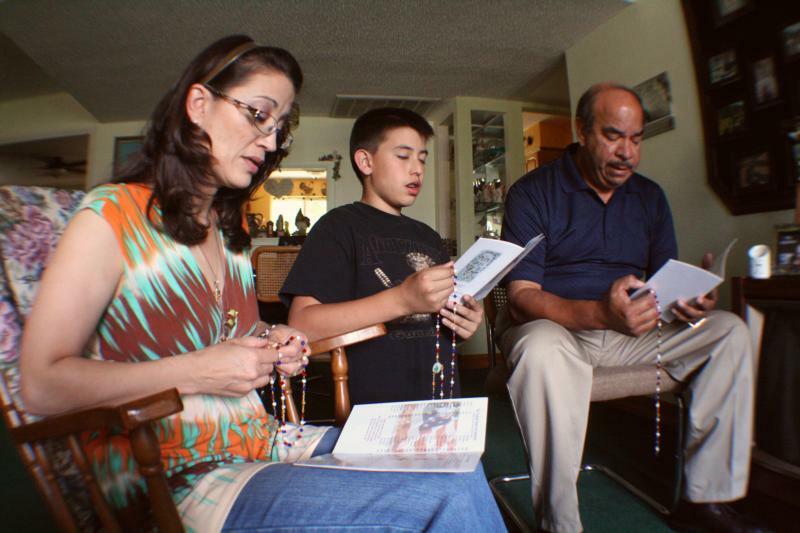 St. Pius X is credited with saying, “If you wish peace to reign in your homes, recite the family rosary.” For families, moments of quiet can be hard to come by. Peace is also shattered by the day-to-day conflicts that are bound to occur in family life. Reflecting on the mysteries of the life, death and resurrection of Jesus also offers the opportunity for families to reflect on their own actions throughout the day and attune their lives to Christ’s. This can lead to something of an examination of conscience, providing opportunities for reconciliation at the day’s end. In the joyful mysteries, we learn about the life of Jesus and God’s plan for him and his family. The sorrowful mysteries, through meditation on Jesus’ passion and death, illustrate that no one is immune from suffering, even the Son of God. The luminous mysteries offer us an opportunity to grow in knowledge of ourselves and the universe, and, most importantly, of God and our relationship with him. The glorious mysteries provide a backdrop for our hope in eternal life, according to which we pattern our lives. PREVIOUS: Too distracted to pray the rosary?